Our Knowledge Tags feature lets you bring the power of schema to your webpage. 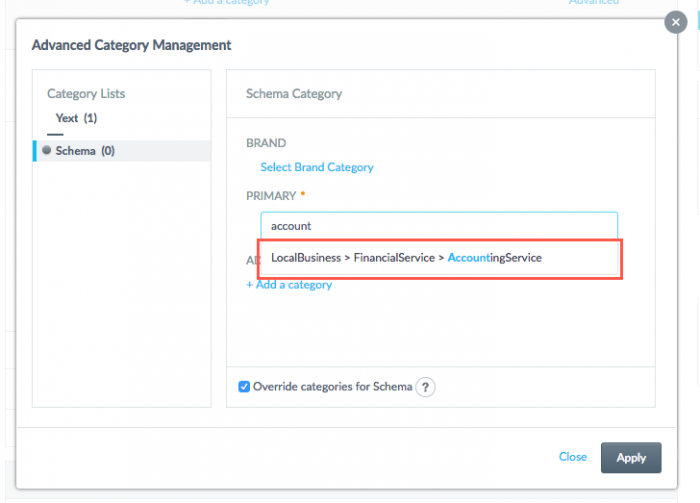 Use schema from Yext to prime your webpage for the intelligent services of the future. Don’t waste time creating schema that conforms to Schema.org’s standards when we can do it for you quickly and automatically. Schema: Add perfect, always-up-to-date schema to a webpage for a location or person. Knowledge Sync: Sync the content on a website with the Yext Knowledge Engine so that the visible content stays current. Analytics: Pull basic website analytics from a webpage into Yext Analytics. 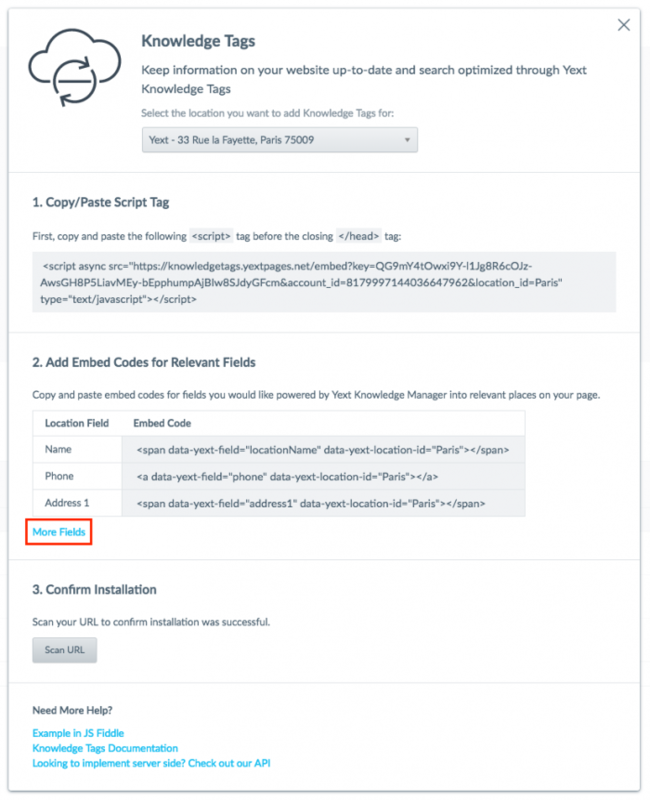 You can implement Knowledge Tags in minutes by following the steps below. 1. In the Yext platform, go to the “Knowledge Tags” page (Pages > Knowledge Tags), and click Add Knowledge Tags to Website. 2. You’ll be prompted with a large dialogue box. Simply follow the flow to add Knowledge Tags to your page and keep your content in sync with Yext. 3. Click More Fields to see all of the fields that you have access to. You can also copy and paste the code for each field by clicking directly on the embed code! To see the pages on which you’ve used Knowledge Tags, refer to the bottom of the “Knowledge Tags” page: You can observe websites on which we’ve received activity—meaning that a user viewed that page with Knowledge Tags active—and the date on which we received that last activity. If the date is further behind than you expect, you should check in on that website! Also, you can scan that page easily with the Scan URL button in that row. 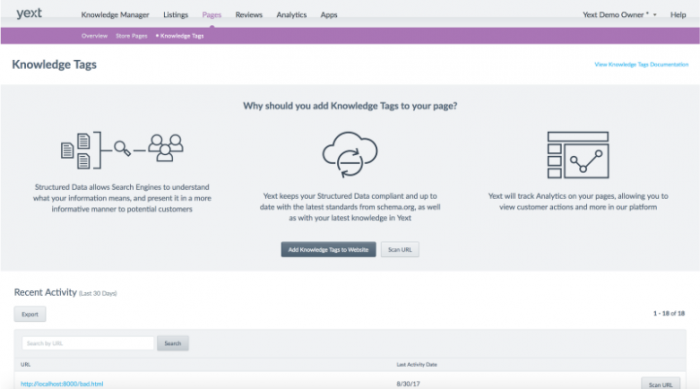 While Knowledge Tags are meant to be simple for anyone to set up, we’ve included a number of advanced features to make it easy for developers to customize the implementation to meet on their needs. Let’s start with the the script tag. Putting the script tag in your page’s markup is the first step in setting up Knowledge Tags. The list below shows the fields commonly used in Knowledge Tags. Note that not all fields work on spans; make sure you use the correct HTML tag for each field. When the a tag is used, the phone number is displayed as a link that, when clicked, dials the number in the device’s phone app (if applicable). When the span tag is used, the phone number is displayed as text. To customize the link text, enter the text between the a tags. where [ID] is the id of the custom field and [HTML_TAG] is a or span. Custom field IDs can be found in the customFields Location field or in responses to Custom Fields: List requests. For more details about displaying custom-field content with embed tags, see the “Other available fields” section of this guide. Use CSS to style the tags on your page. None of the Knowledge Tags have CSS associated with them, so if you have already styled your page, replacing static content with embed codes should not affect your site’s appearance. Note that any embedded content in the Tags’ fields will be provided in the specified language, as well. 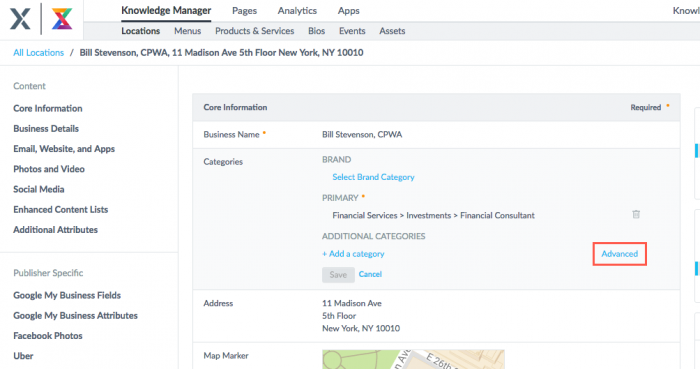 Log in to the Yext platform to view your location’s details. Click on Categories, and then click Advanced. 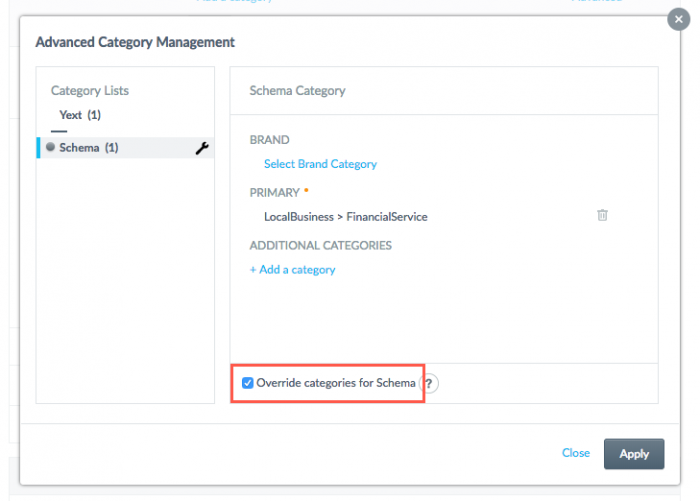 In the dialog box, click Schema, and select the Override categories for Schema option. Click the trash can icon next to the primary category, then click Select primary category. 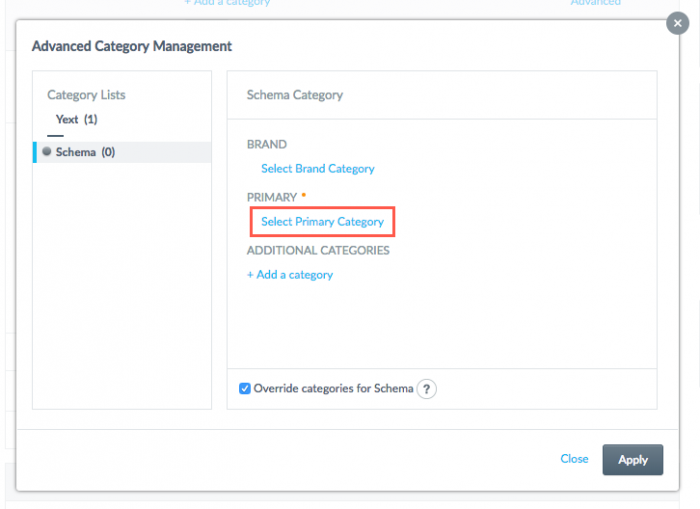 Enter the category that should appear in your schema. Select your category from the list that appears as you type. An example is shown below. If you want to make other manual adjustments to the schema, you can use our Schema API directly. The Schema API is a server-side API that returns a JSON schema object. It is up to you to add this JSON-LD object to the webpage once you retrieve it, but adding it allows you to manipulate the JSON in order to customize it exactly how you want it. While doing so may be useful in some situations, changing the schema is generally not recommended. Knowledge Tags schema will be updated automatically as schema definitions change, so you should not assume that the JSON-LD object you put directly into your page’s markup will remain current over time. 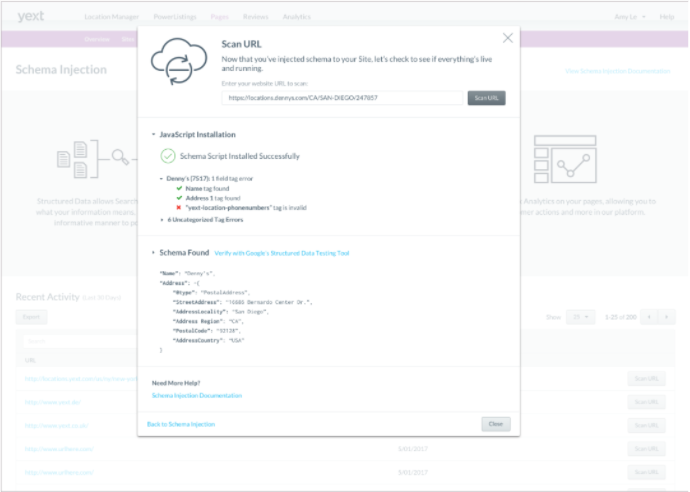 For more information on the Schema API endpoint, see the Live API documentation. For more information about Knowledge Tags, watch our video tutorial series.